The lip balm has a very subtle lemon candy scent that you can only smell during application and it doesn't linger on the lips. It is also completely tasteless. You don't really see it during the day, but in the evening, the very fine, micro shimmers become a lot more visible. Compared to the Etude House Dear my Jelly Lips-talk JBE101 that I have, which is also similar to a transparent, shimmery lip balm, the Maybelline Baby Lips Intense Care gives off a silvery glow due to the silver micro shimmers, whereas the one from Etude House has a very visible yellow gloss and very fine holographic pink shimmers that makes it look a bit more healthy. 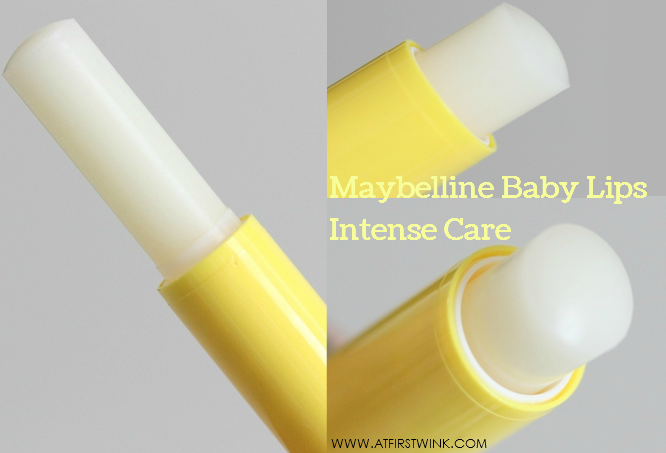 I like how the Maybelline Baby Lips Intense Care makes my lips glossy and soft, without being heavy or sticky. The silver glow might not look too good, when I am feeling a bit under the weather, so during those times, I prefer using the Etude House Dear My Jelly Lips-talk JBE101. As I have such good experience with this Maybelline Baby Lips lip balm, I am very curious about the other versions. Update: I have bought the Maybelline Baby Lips Cherry Me and Hydrate too.